Discussion in 'Effects, Pedals, Strings & Things' started by mrwrang, Apr 22, 2016. Looking for a chorus to do subtle widening. More of a spatial effect than actual chorus. I know both the CE-20 and Corona does a dimension c emulation, but the Ibanez (cs-9 at least) seems like a great stereo effect as well judging from the few stereo clips I could find. Mix and tone on the tc and boss might be great to tailor the sound. TC and Ibanez can be found pretty cheap used here in denmark. Boss CE-20 would easily be 2-3 times the price. Any other suggestions? How do the other Ibanez choruses compare to the cs9? Keeley Stereo 30ms when it comes out should do the trick?! KnowTalent, slicepaperdavid, Glass Onion and 2 others like this. Good point. Thought of mentioning detune as well, and I have a PS-3 that does stereo detune. I'm using it for mode 7 though. I would like to try a subtle chorus for a little extra movement than detune. Source Audio Gemini is pretty great stereo chorus. With the editing capabilities, you should be able to dial in a nice, subtle chorus. Love mine. KnowTalent and mowatsmith like this. Of the ones mentioned, I'd go for the Corona. With the Toneprints, the mix knob and the editor available, you should be able to set something suitably subtle up. Something in the SCF vein should do the trick. I like the vintage Ibanez CS-505 the best but it really only does that gritty analog shorts thing. The TC choruses are great for digital chorus and they're super versatile. I played the TC Corona and the Gravy side by side and thought the Gravy sounded much better. It was just a lot thicker and wider to my ears. I've had an Analogman Stereo Chorus on my board for 6-8yrs now. Does a great subtle widening sound which is how I usually have it set. It can get pretty swirly, but I like it set for a subtle stereo spread and use it often for both clean and dirty sounds. I really like putting a delay pedal after each output for ping-pong repeats and the sound just wraps around me in my jam room. Check out the two Red Witch choruses, Empress and Medusa. They are dry/wet stereo. It is precisely working around 30 milliseconds in thickening your original signal to modulate, detune, chorus cherry topped by reverb (not in pro-mode). I usually use the abbey mode and reverb with just a hint of modulation around 23-27 milliseconds at just under unity. Barely hear it working unless i bypass the pedal and realize how dry my signal is. The Keeley does look cool indeed, very useful, user friendly and to the point. I think I'm going to add that to the list of potential pedals. They just don't come up used, and I'm on a budget right know, so maybe I'm just gonna go for the Corona. Sale and resale for those is no biggie. The Seafoam+ seems cool too, having a more limited double tracking effect, but a standard and 2-band chorus. Definitely will check out both Keeleys before going with tone or the other! What do you mean? Properly? It has a dry side and a wet side in stereo. Both sides are not wet. So for wet it is fine but wet dry wet not so much. But if you have a marshall four input or another amp you can plug into dual inputs without phase trouble it can do crazy CRAZY stuff. Or even into one amp if you want good swirly none moving modulation or moving modulation. 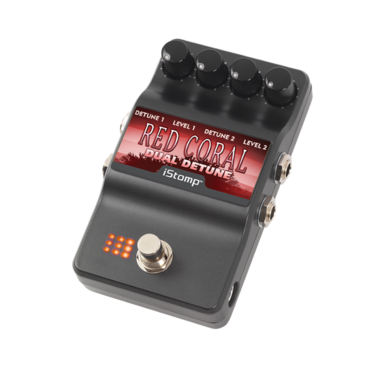 I'll add iStomp Red Coral to the true stereo list. For clean I run it in true stereo but for hard distortion I actually prefer running it after distortion wet/dry with both the detune voices going to one amp. In wet/dry its the lag between the 2 amps which still seem to make both amps involved in the effect even in truth only one amp is producing the effect.